At SCA, your son will receive outstanding instruction in the classroom and develop confidence through our military tradition, but that's just the beginning. St. Catherine's Academy offers a rich student experience, including faith formation, athletics, arts, and community service. Our school is truly a community where you will find boys having fun and learning together. First and foremost, St. Catherine's Academy is a Catholic school. Our program and our campus are rooted in the Catholic faith. Welcoming students of all religious traditions, we help each student grow in his personal faith through our school-wide formation program, prayer and liturgical experiences, and service learning. Camaraderie and community are emphasized by our military and Catholic traditions. 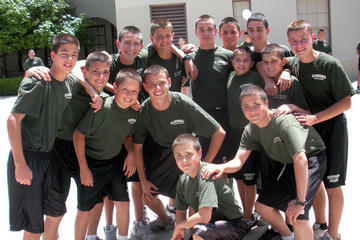 In fact, many cadets list "brotherhood" as their favorite aspect of St. Catherine's Academy. SCA students learn to work together, rely on each other, and help one another. They form lasting bonds. SCA offers a variety of extracurricular activities to help our students become the well-rounded leaders our future needs. Students can participate in athletics, music, and more. Our campus is alive all year long! St. Catherine's Academy offers two great summer programs. Our Summer Enrichment Program combines academics and recreational activities in a fun, month-long experience. Leadership Camp is an exciting and challenging one-week camp that teaches young men the fundamentals of leadership, discipline, and teamwork by incorporating high-ropes courses, rock rappelling, and more. We invite you to explore the pages in our Student Life section to find information on, spiritual life, athletics, music programs, extended care, and summer programs.